In the Protestant understanding of knowledge we learned that there were two sources: general revelation (science and other forms of secular knowledge) and special revelation (the Bible). The topic was called “epistemology” or the “theory of knowing”. The following diagram illustrates the way the epistemology of most Protestant denominations works (courtesy my theology professor). But then in the summer of 2015 I started looking into the Eastern Orthodox approach to Christianity. (I have blogged elsewhere about that journey.) When I ran into 2 Thessalonians 2:15 (in particular) in the context of Orthodoxy, that was reason to give me pause about all my assumptions. 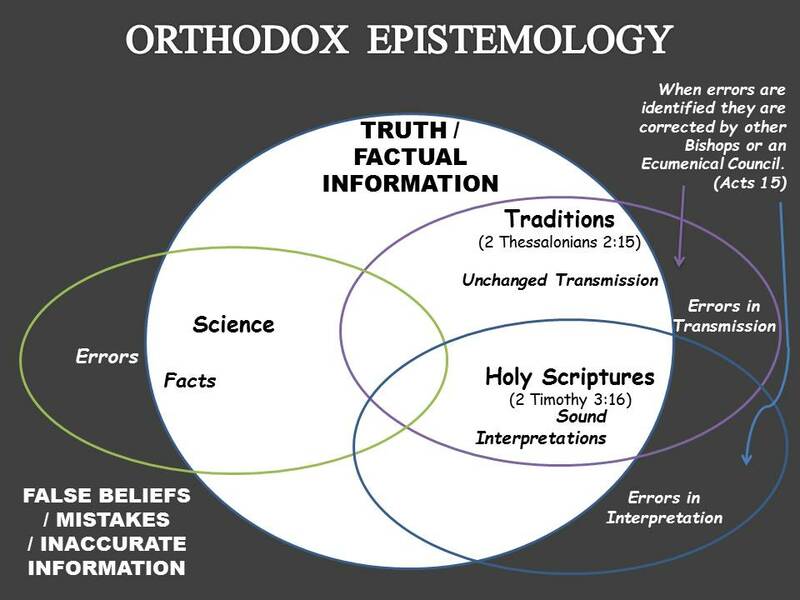 The follow diagram summarizes then how Eastern Orthodox epistemology works. Naturally this is not the only passage to make reference to tradition. So tradition can refer to spoken word or oral tradition. In the following verses the word “delivered” is the verb form (paredoka) of the Greek word for tradition used in the above verses. Incidentally, contrary to what many assume, Orthodox Christians are encouraged to read the Bible in their personal devotions, but interpretation is to be guided by tradition: “knowing this first, that no prophecy of Scripture is of any private interpretation” (2 Peter 1:20, NKJV). The early church fathers made mention of tradition as well. Here are a few examples. These are just three of many citations Shanbour makes. Among the elements which make up the Holy Tradition of the Church, the Bible holds the first place. Next comes the Church’s liturgical life and its prayer, then its dogmatic decisions and the acts of its approved churchly councils, the writings of the church fathers, the lives of the saints, the canon laws, and finally the iconographic tradition together with the other inspired forms of creative artistic expression such as music and architecture. All of the elements of Holy Tradition are organically linked together in real life. None of them stands alone. None may be separated or isolated from the other or from the wholeness of the life of the Church.